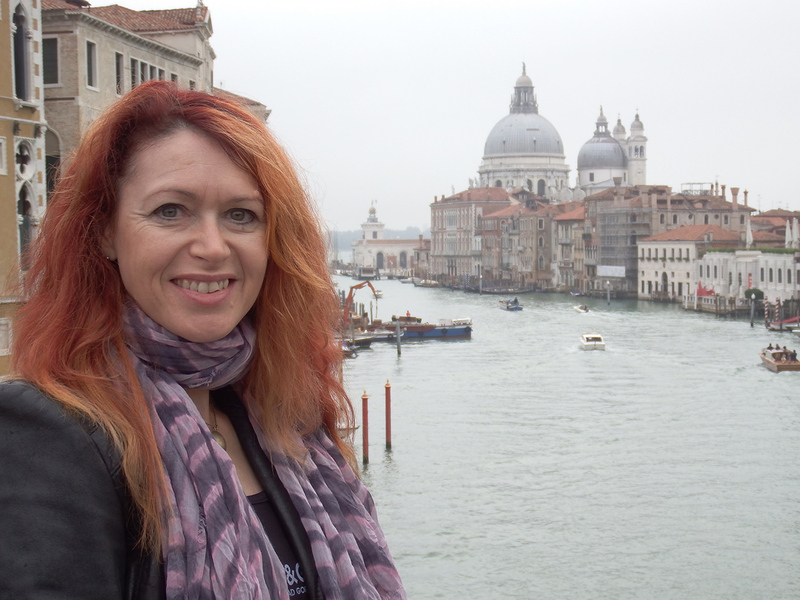 Roz Morris with the Grand Canal and Santa Maria della Salute behind. Last week was one of the most exciting I’ve had in years. 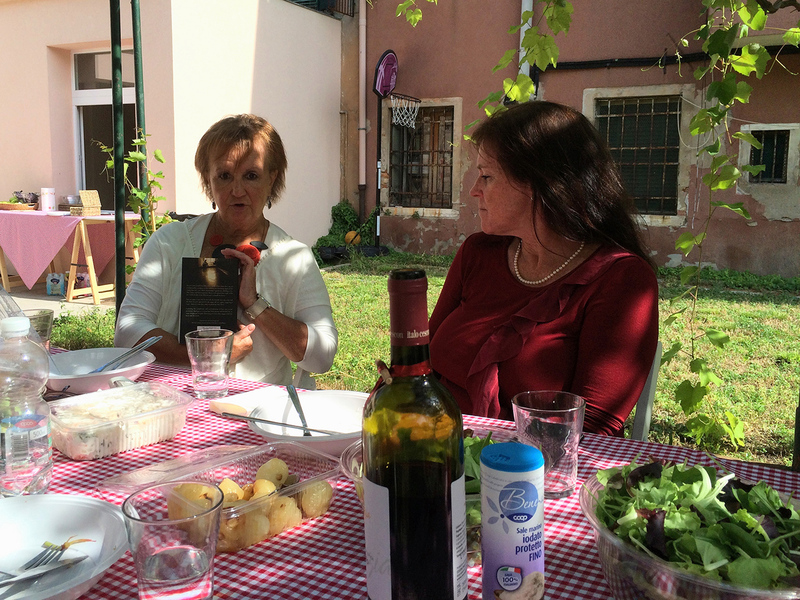 On Monday 14th September, I flew out to Venice with Roz Morris, who was set to deliver her Self-Editing for Authors course on behalf of my sister Janys Hyde’s Creative Retreats in Italy enterprise (also publicised via her Words of a Feather blog). As we set out from Gatwick, we were both full of excited anticipation about how things would turn out. 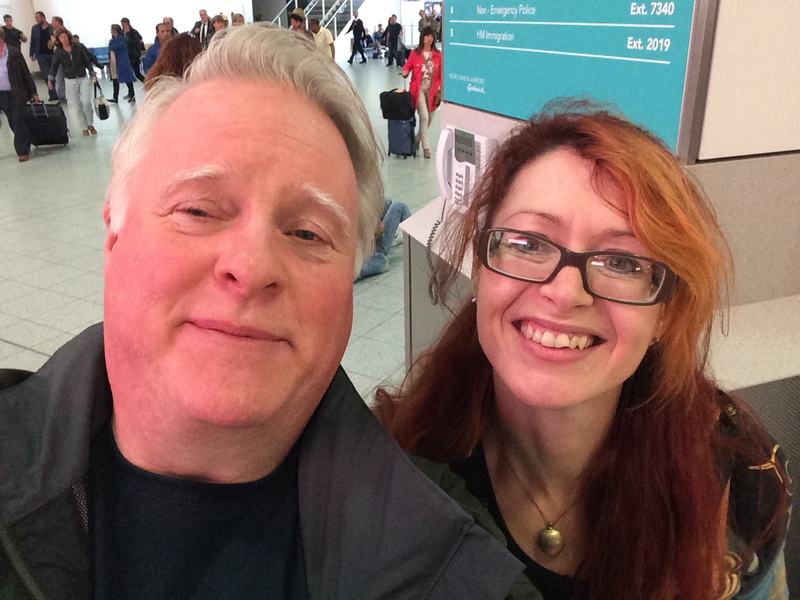 Me and Roz Morris at Gatwick waiting to depart. 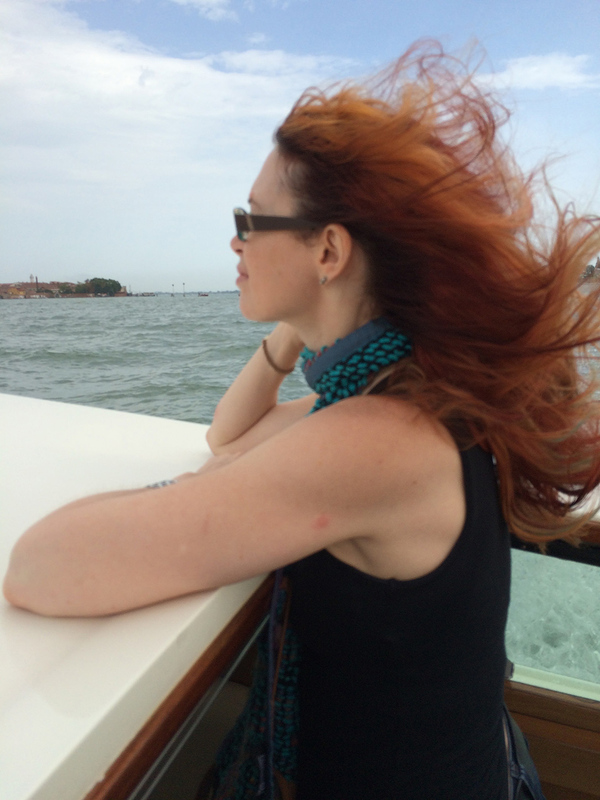 We arrived in Venice late at night, thanks to a delayed flight, but were kept alert by the taxi driver who took us to Piazzale Roma at speeds approaching Formula 1 velocity. 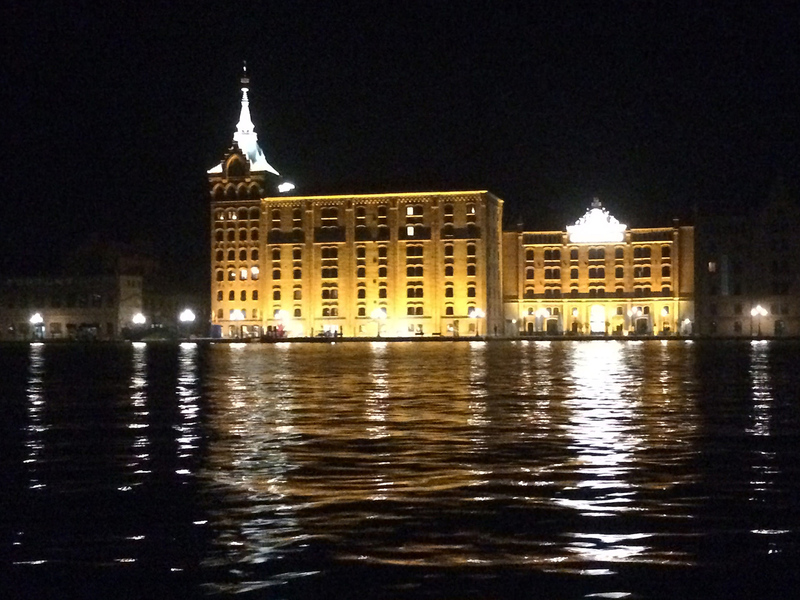 Then we enjoyed a night-time vaporetto trip to the island of Giudecca, accompanied by half the mosquitoes in Venice! Fortunately, they seemed more interested in the boat’s overhead lights than in us. 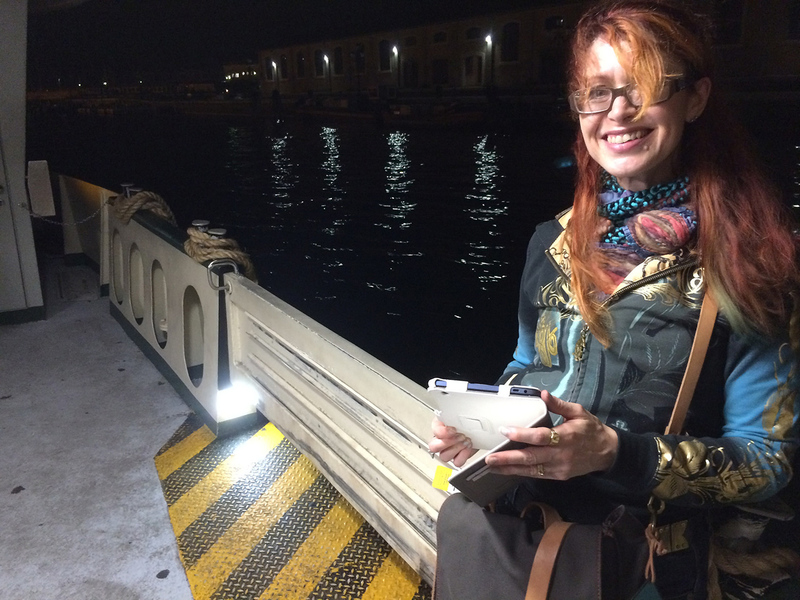 Roz on the night vaporetto to Giudecca. 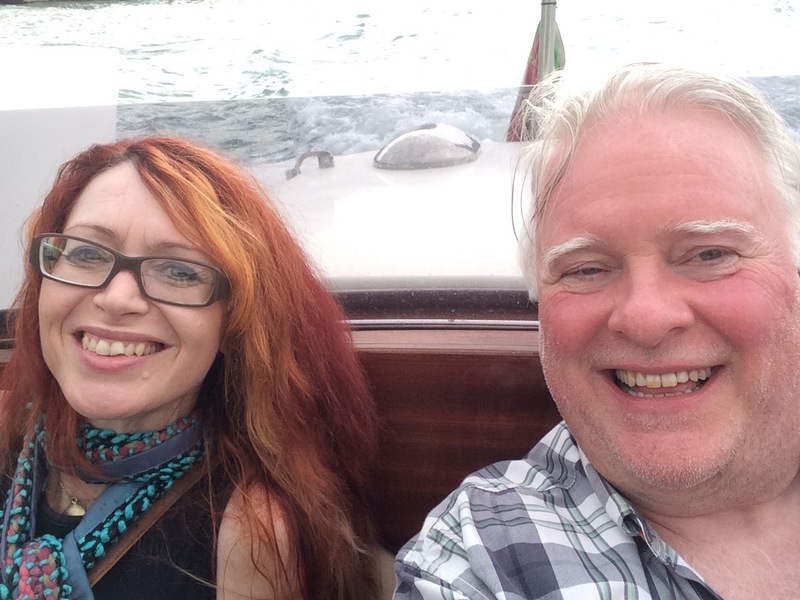 We were greeted at the Palanca boat stop on Giudecca at well after 1am by my sister and also by Daniela Bortolini, representing the owner of the Molino Stucky apartment where I would be staying for the next few days – now that’s what I call outstanding service. The night was very warm, and it was hot and humid all week; I should have renamed my accommodation the Molino Sticky! The Molino Stucky Hotel and Apartments on Giudecca. The following morning, Roz, Janys and I met up at the course venue where we greeted the arriving students. The place was lovely, a light and pleasant space with kitchen facilities for drinks and snacks and a wonderful courtyard which had lawn areas, shade trees and a beautiful overhead vine, a perfect spot for lunch. The venue for the course, the Spazio Bocciofila on Giudecca. Roz is the consummate professional and delivered her course with as much verve in front of a small group as she would have in front of the prestigious Guardian Masterclass in central London. 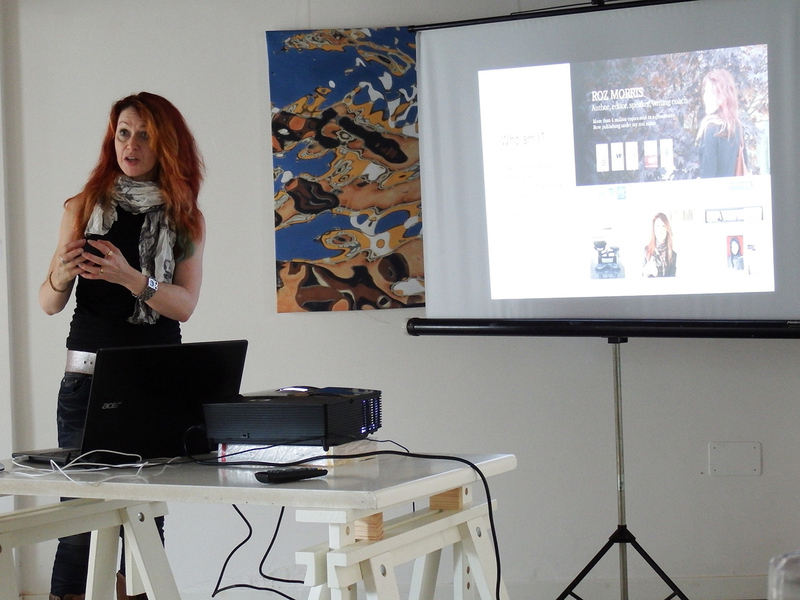 The students were treated to the insights of an author who has not only published two novels of her own, but who has also ghost-written books for big names that have achieved more than four million sales worldwide. Roz also edits for professional authors and of course you may be familiar with her blogs and Nail Your Novel series of books. 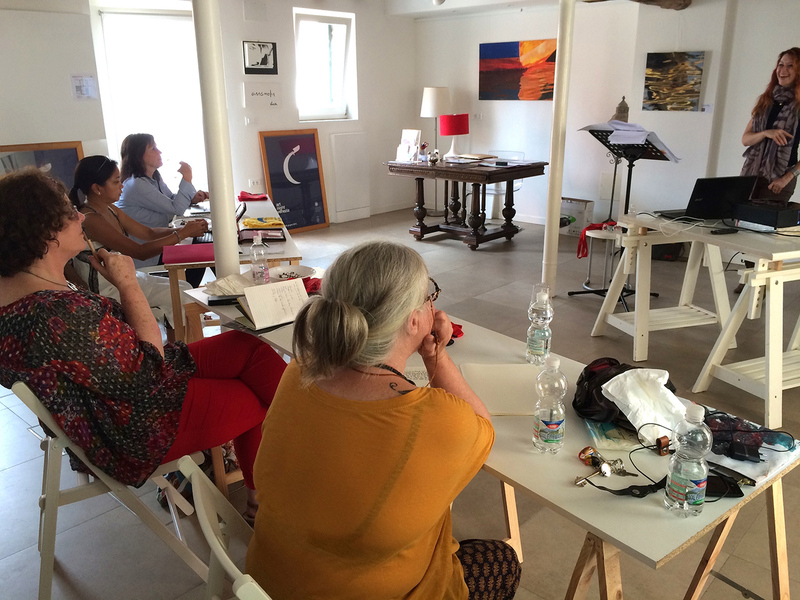 Roz Morris teaching the self-editing course. The techniques taught by Roz are a revelation even to seasoned editors such as myself. Over many years, she has evolved a really clever system which works not only at the theoretical level, but which has also been tested in the heat of battle – a thoroughly practical approach which has worked time and time again for real books that have gone on to be hugely successful. Naturally, what really makes a course like this special is the opportunity not only to receive Roz’s in-depth teaching about the craft of editing, but also to ask pertinent questions about how the techniques being explained can be applied to your own work, and all the students found this aspect of the two days invaluable. Q&A discussions ranged far and wide, but our marvellous tutor always managed to keep things on course and on time. Lindsay Stanberry-Flynn (left) describes her route to publication. The cherry atop the icing on Day 1 was provided by visiting author Lindsay Stanberry-Flynn, who popped in at lunchtime to explain the journey she has taken to becoming a published author and the satisfaction she derives from the craft. Thanks Lindsay! After a packed first day, we retired to rest overnight. I took the opportunity to re-acquaint myself with a city I love but which I hadn’t seen for ten years, in the company of Roz and Janys and brother-in-law Claudio. After a delicious pizza, we took Claudio’s small motor boat around the dark and atmospheric canals of Venice, meandering both along tiny back alleys and then out onto the magnificent Grand Canal, under the Rialto Bridge and then mooring up near a typical ‘campo’ (a small piazza) where we found couples dancing the tango. To add to the magic of the evening, we ate some of the best ice cream I have ever tasted while we watched the dancers spin and slide in intimate embrace across the square. 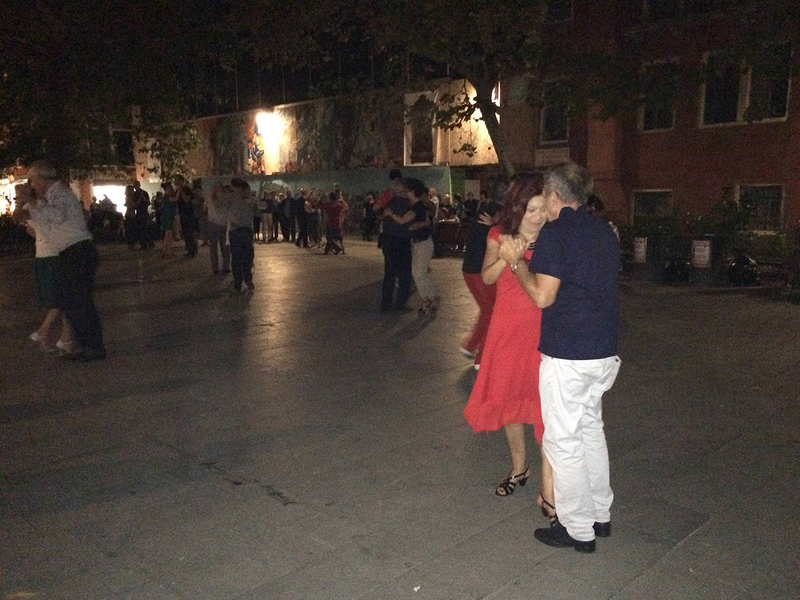 Tango dancers in Venice by night. Day 2 began with a rest period for the students to either do their own writing or top up their creative juices around the city. Roz and I used the time to explore the city and do a little shopping, punctuated by occasional stops for coffee (how could you not?) and, in my case, the fabulous little triangular sandwiches known as tramezzini. Back in the classroom in time for lunch, and I took the opportunity to give the students some advice about designing and laying out your own book using Adobe InDesign, and the process required to create print-ready artwork. I also gave a few insights into the difference between the control over layout you can retain in PDF format, but which is out of your hands when producing ebooks for, say, Kindle. 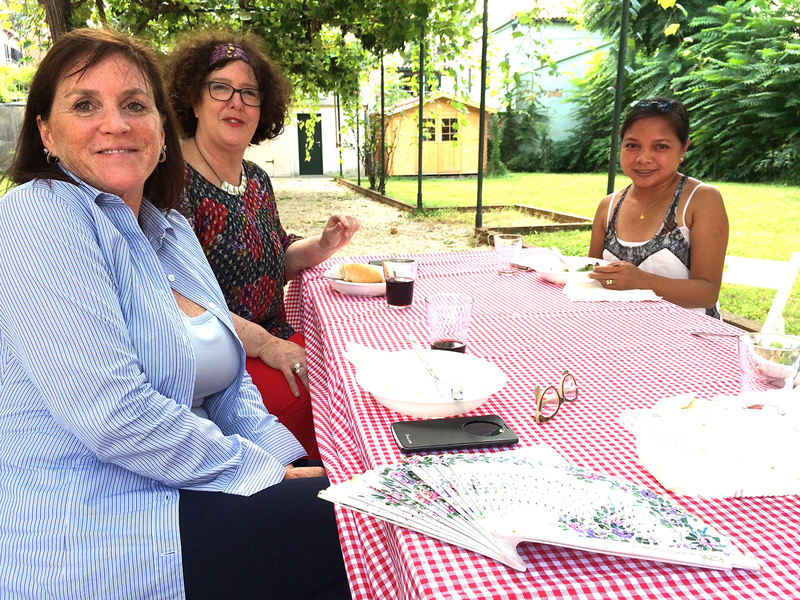 Self-editing course students Tammy, Barbara and Angelica in the lovely courtyard for lunch. Roz then finished her self-editing teaching, adding more information about the process required and concluding with a useful summary of the techniques she had demonstrated over the day and a half of the course. I was also able to contribute to the closing session by revealing the truth about traditional publishing contracts, using one of my own with Pen & Sword as an example. Roz Morris hosting the final Q&A session. The students were all shocked at how low the royalty percentages are (and please note that there’s nothing especially bad about my publishers – it’s just a standard industry contract) and also hadn’t realised that an ‘advance’ means an advance on royalties, i.e. you receive no further payment until the advance has been paid back in full! Many, if not most authors who have received an advance therefore receive no royalties. I count myself as extremely fortunate that my first book has done well enough to lead to additional royalty payments. It also came as a shock to learn that the royalties are based on the price the book is actually sold at, and not the cover price! There followed fond farewells and good luck wishes for our talented students who would now return home, brains abuzz with thoughts on improving their writing with professional editing skills learned from one of the best in the business. We wish them well for their creative ventures and thank them for being the ‘guinea pigs’ for our first ever writing retreat in Venice. A huge round of applause too for my sister Janys, who went several extra miles to ensure that everything ran according to plan and that everyone went away not only well educated, but well fed too! 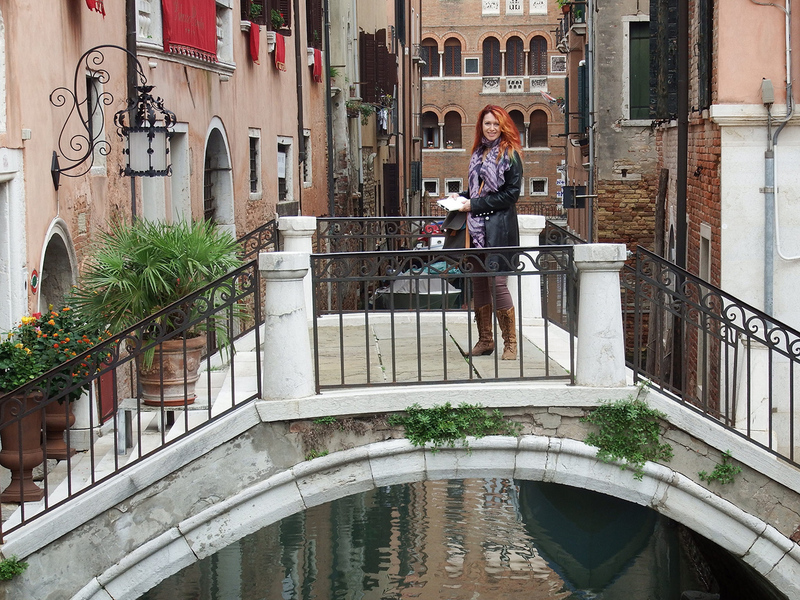 Roz posing on a typical bridge in Venice. And of course last, but by no means least, huge thanks to the wonderful Roz Morris who proved yet again that she is one of the leaders in her field, combining the talents of best-selling author and ruthless editor in a hugely engaging and charming personality. Roz looking very Hollwood as we headed for the airport on a water taxi. Look out for another post here soon, because I have asked Roz to answer a series of questions about the experience of running a course like this from her perspective. 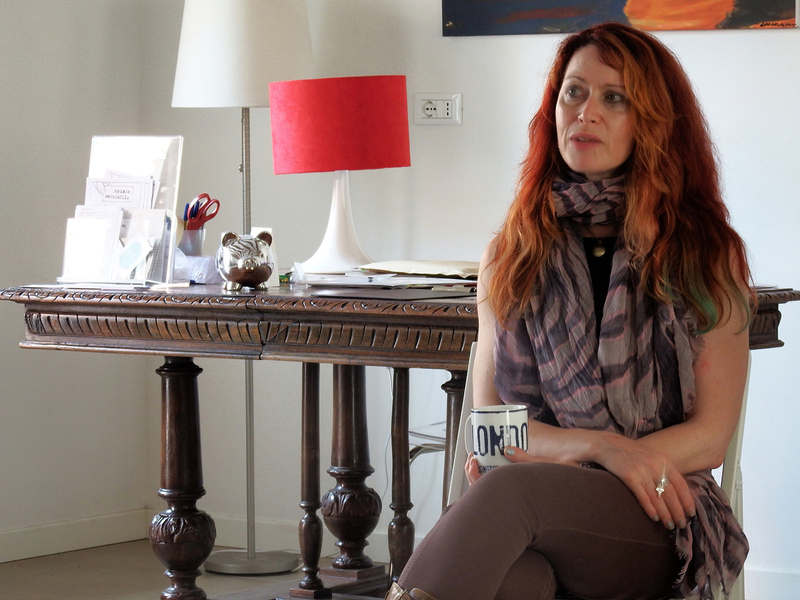 It was a tall order to ask her to travel halfway across Europe, to teach a course on behalf of a brand new enterprise, in a venue she had never seen, to a group of students with widely varying interests – but of course, she delivered it with aplomb. Bravo Roz! Postscript: apologies to those of you who receive updates in newsletter format because one of the photos originally appeared upside down for reasons beyond my comprehension! Thanks for the expert guidance, Henry – and now I know how to spell all those Italian words you were trying to teach me! Thanks for the mention, Henry. It was lovely to be able to ‘pop in’ for lunch, and what a delicious lunch! I enjoyed meeting everyone. I’m doing final revisions of my latest novel at the moment – where’s an emoticon when you need one, Roz?! Sounds good to me, Henry!